Son Ceste elle te baille à fin de le garder. Me tirant de tes yeux une fleche cruelle. Guarissez, ou cessez de plus me commander. Qui fait la Lune vieille, ou qui la fait nouvelle. Cherchez autre escolier, Deesses, je vous quitte. Handed you her girdle so that you could guard it. You eyes shooting me with a cruel dart. Mortal wound, or cease henceforth to command me. Or if Chance or God made this universe. Seek some other pupil, goddesses : I abandon you. When Ronsard talks of the Muses, it’s easy to forget there were Muses in charge of things other than poetry or music: astronomy, for instance. That was Urania. In line 2, it’s worth noting that Venus’s “cestus”, her magic girdle, ‘gave the wearer the power to excite love’ (Wiktionary). Mon esprit et mon cœur, ta proye miserable. Le feu qui de mes oz se paist insatiable. Qui ne peut se garder ny prevoir son dommage. Qui mit tout l’Asie et l’Europe en pillage. My spirit and my heart as your wretched prey. A fire which feeds insatiably on my bones. And cannot guard himself nor foresee what will hurt him. Which put all Asia and Europe to pillage. 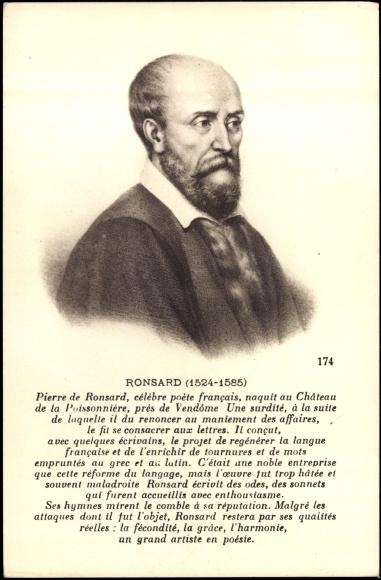 Lengthy footnotes today from Ronsard’s editor, Richelet, to explain the slightly tortuous meaning in several places in the poem. In lines 1-2, Richelet explains, “the name she has was not given because of any sweetness in her, [nor] as coming from the word ‘eleein’ [Greek ελεειν, to weep], but rather from ‘helein’ [ελειν, to seize], ‘helinnuein’ [ελιννευειν, to rest], ‘helissein’ [ελισσειν, to whirl around], ‘helkein’ [ελκειν, to drag off] which are all words of ruin and damage.” (Though, as you can see, Liddell & Scott don’t agree that one of them – ‘helinneuein’ – falls into this category!) Note however that Ronsard’s French amounts to a set of meanings for just two of those words (‘helein’ and ‘helkein’) . I imagine we owe the inclusion of the other two, more obscure, words (one of which is doubtful) more to Richelet than to Ronsard. At line 7, Blanchemain reminds us that Helen, with Sinon, gave the signal to the Greeks to emerge from the Trojan Horse and thus to burn Troy; though Richelet expounds at length on lines 9-11 which seem to refer to a slightly earlier episode: “after the Greeks had, by the counsel of Minerva, placed the horse in Troy, Venus, knowing their plan and wishing to have it discovered by the Trojans, came at night on the garb of an old woman to Helen, to give her information about the horse, in which among others was her husband Menelaus. At this report, as soon as she’d leapt from her bed, she came to the horse and spoke to the Greeks who were hidden insde, which frightened them so much that she thought she had put them in danger”. But this, it seems to me, does not fit with “que tu feignois” (the phrase to which Richelet attached the explanation): for Ronsard is clearly saying Helen ‘feigned’ another’s voice or said something misleading to the Greeks – as if she not Minerva were in disguise, or she was seeking to deceive the Greeks in the horse – which is not at all what Richelet describes. Rather, Ronsard is referring to Homer’s Odyssey (book 4, 270-290) where Menelaus tells Helen he knows how she came to the Horse “bidden by some god” to try to trick the Greeks into giving themselves away by imitating the voices of their wives and lovers. Sorry, Richelet: wrong this time. Et que je me dements parlant trop bassement. Di moi, je te suppli, di moi que doi-je faire ? A ce monstre testu, divers en jugement ? Ce monstrueux Prothé, qui se change à tous cous ? Et nous rire de lui, comme il se rit de nous. And that I’ve gone mad for speaking in too low a style. Tell me, I beg, tell me what must I do? This many-headed monster, with such varied opinions? When I write in a low style, they just abuse me. This monstrous Proteus who changes shape at every moment? And laugh at them, as they laugh at us. Des livres immortels, di-moi, que doi-je faire ? Tiendrai-je ce Prothé, qui se change à tous cous ? To immortal books, tell me, what should I do? Can I hold this Proteus who changes shape at every moment? Des livres immortels, dy-moy, que doy-je faire ? Quand ma voix se desenfle, il ne fait que mesdire. Tiendray-je ce Prothé, qui se change à tous coups ? Et nous rire de luy, comme il se rit de nous. When my voice becomes less grand, they just abuse me. Et que je me démens parlant trop bassement. A ce monstre testu divers en jugement ? Quand ma voix se desenfle, il ne fait qu’en mesdire. Tiendray-je ce Proté qui se change à tous coups ? Et qu’elle se desment parlant trop bassement. Quand ma voix se rabaisse il ne fait qu’en mesdire. Et nous rire de luy comme il se rit de nous. And that she’s gone mad for speaking in too low a style. No doubt, as it was the opening poem in the Continuation des Amours and then became the first poem of book 2 in its various editions, Ronsard would have devoted significant effort to thinking and re-thinking the way his book opens. Neither is a great sin, of course, but neither is a version Ronsard actually authorised! D’aimer en autre lieu ne nous pourra mener. Sans gouster la douceur des douceurs la meilleure. Que je n’aimeray point puissai-je trépasser! Your love cannot be given anywhere better. To love elsewhere be able to lead us away. Without tasting the sweetest sweet of all. When I cease loving, may I die! Il faut vostre jeunesse à l’amour adonner. Ne me pourra le cœur du vostre detourner. Que je n’aimeray point puissai-je trespasser! You should give your youth to love. Be able to turn my heart away from yours. Pecher contre son nom ne se doit pardonner. Ne me pourra l’esprit d’une autre emprisonner. Il fault aimer, maistresse, au monde quelque chose. Que je n’aimeray plus puissai-je trespasser! Sinning against your own name you should not forgive yourself. Let me emprison the spirit of another lady. A qui trahist Nature il ne faut pardonner. Il faut aimer, maistresse, au monde quelque chose. Que je n’aimeray plus puissé-je trespasser. And anyone who betrays Nature ought not to be forgiven. Il fault suyvre Nature, et ne l’abandonner. You should follow Nature and not abandon her. Pour une belle Dame une playe incurable. A ta playe amoureuse un secours allegeable. Chantant sur son flageol sa belle Galatée. « Qui vient de trop aimer quand elle est bien chantée. An incurable wound for a fair lady. “For nothing can force Venus’s power”. Some aid to lighten your lover’s wound. Singing with his flute about his fair Galatea. I’m not sure I can think of another poem we’ve looked at in which he compares one of his (male) friends to a god! His mistresses, yes, it’s virtually a given in love poetry; but to compare his friend to Apollo, not just for his situation but for his appearance and his art? Impressive. So who was this Patoillet? Belleau’s commentary tells us: “Jean Patoillet, one of our best and loyalest friends, (was) a man of great judgement, great reading, and best-versed in the knowledge of languages, history and other good learning.” To this we can add that he was a native of Dijon, eldest of seven children, never married (though left one illegitimate child, later legitimated by royal order), and died in 1585. He was a protonotary apostolic (a very high papal official), and as a local notable was also the dedicatee of a contemporary history of Dijon. His epitaph recorded that he could recite from memory large chunks of the major classical authors; and he was supposed to have worked on a History though nothing seems to have survived. In other words, a good solid Renaissance man! Ironically, however, the poem was originally addressed to someone else: see below! Jacques Grévin was a playwright and poet, and a member of Ronsard’s circle until they fell out. Like so many others, he wrote a book of sonnets (L’Olimpe, addressed to his fiancée, though they subsequently parted); though he is remembered more for his plays. His first major success, on Julius Caesar, was imitated from a Latin play by Muret. Younger, a poet, and more showy than Patoillet, the opening comparison with Apollo fits better! Why did his name disappear? Although Belleau simply says that Ronsard was ‘angry’ with him, in fact they fell out over religion, taking different sides in the struggles between the Catholics and Huguenots (Protestants) in the Wars of Religion. The classical reference, to Polyphemus the cyclops and Galatea, is perhaps best known to us these days through Handel’s “Acis and Galatea”. A ta playe amoureuse un secours profitable. Qui vient de trop aimer quand elle est bien chantée. Some gainful aid for your lover’s wound.